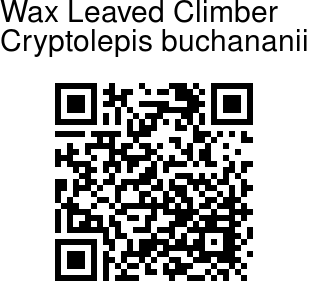 Wax Leaved Climber is a strong woody plant, climbing trees and having ropelike stems. It can grow to 6 m long. Branchlets are pale gray. Leaft stalks are 1 cm long, with an oblong or elliptic leaf-blade, 10-18 × 4.5-7.5 cm. Leaf base is broadly wedge-shaped, tip rounded or sometimes acute. Flower cymes are like panicles, shorter than leaves. The stalk carrying the cyme is 2-5 mm. Sepals are broadly ovate, 1.5 × 1 mm. 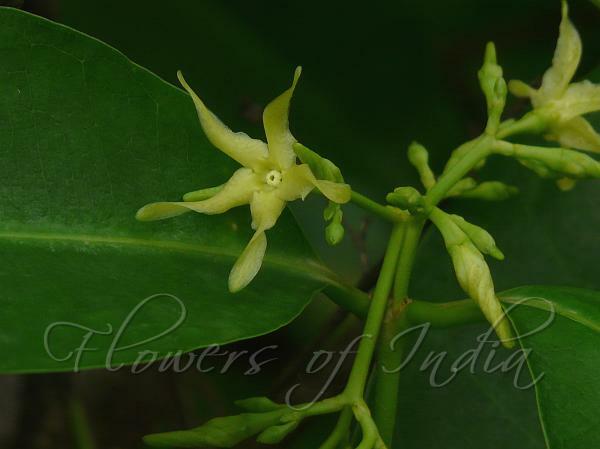 Flowers are greenish yellow or yellow-white. Flower tube is 2 mm, petals are long, linear-lancelike, 7 × 1.5-2 mm. Seed pod is cylindric, 6.5-9 × 1-2 cm, with 2 longitudinal ridges. Seeds are brownish, ovate-oblong. Flowering: March-August. Identification credit: Dinesh Valke Photographed at Tungareshwar Wildlife Sanctuary & Pisol fort, Dhule, Maharashtra.